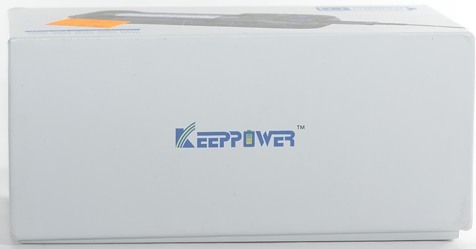 Keeppower is known for its LiIon batteries, but now they have also made a charger. 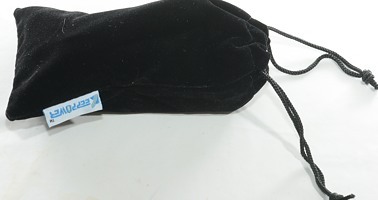 It is a single cell charger with two charge currents and can handle sizes up to 26650, the charger is powered from usb. I got the charger in a cardboard retail box with fairly limited printing on. The box contained the charger, a bag and a usb cable, there was no instruction sheet. The bag is for the charger and the cable. 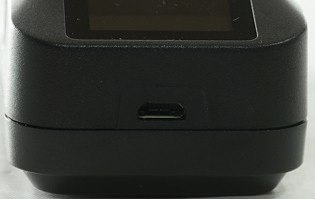 The micro usb connector is placed on the front, just below the display. The user interface is a display and a single button. A press on the button will change between 500mA and 1000mA charge current, but only when there is a battery in the charger. Holding the button down will turn off the display and disable the current change function, the charger will continue to charge with selected current. To turn display on again the button must be held down again. 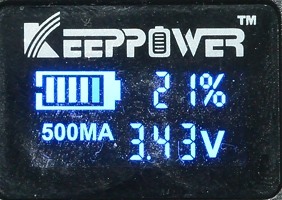 The display has an animated battery icon, charge percent, voltage and selected current. 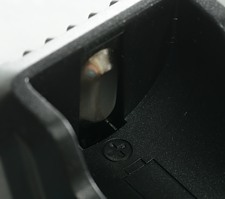 The charge uses the typical slider construction with a metal rail and it works smoothly from about 29.5mm to 71.5mm, i.e. 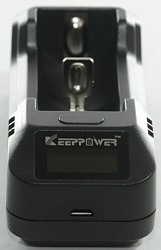 the charger can handle any 18650 and 26650 cells both protected and unprotected. 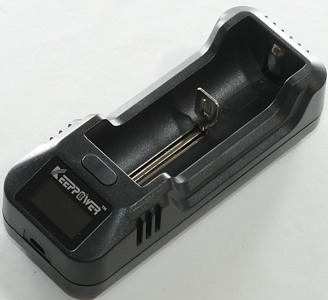 The charger can easily handle 71 mm long batteries, including flat top cells. Below 1 volt the charger will not detect a battery and the current will be zero, this means that it cannot reset protection circuits. 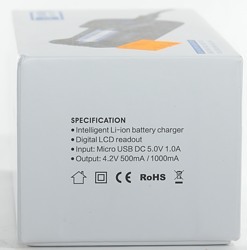 Between 1.0 and 1.8 volt the charger will show empty battery with 0.00 volt, no charge current is applied. 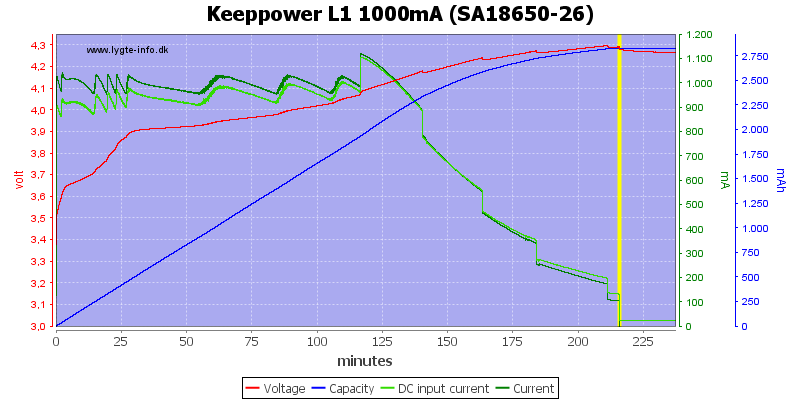 Between 1.8 volt and 3.0 volt the charger will charge with about 100mA at 500mA setting and 200mA at 1000mA setting. 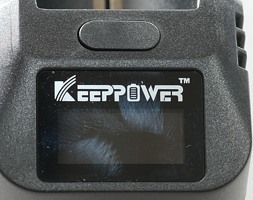 Above 3.0 volt the charger will use regular charging. The charger will not restart if battery voltage drops. Voltmeter works from 1.8 volt to about 4.3 volt and is within 0.03 volt. It will continue to update when charging is finished. 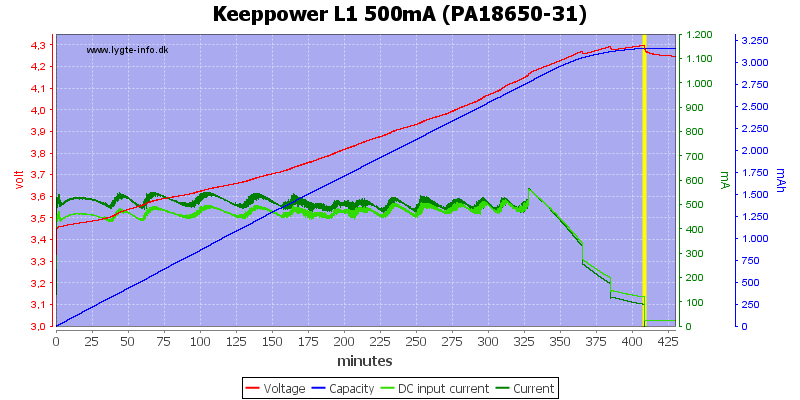 When charging is finished the charger will discharge the battery with about 20uA. 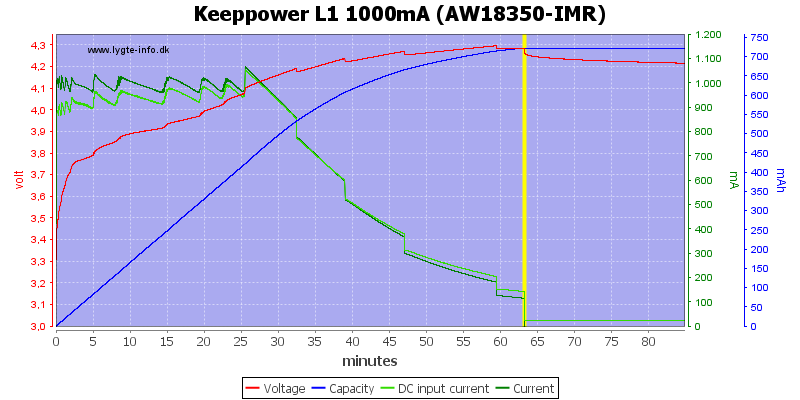 When charger is without power it discharge the battery with about 40uA. 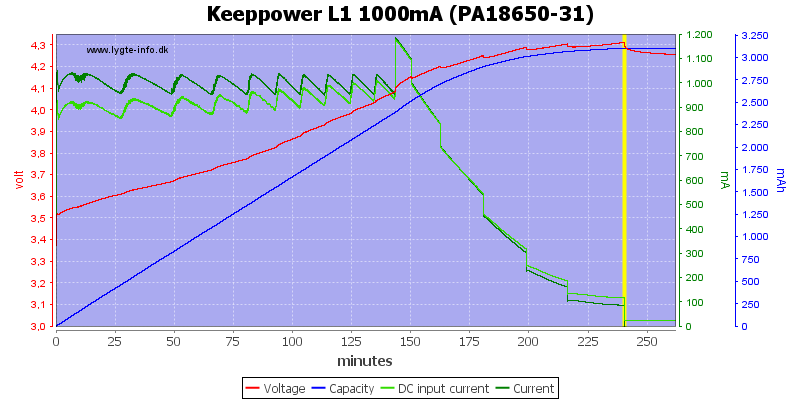 At first glance this looks like a good CC/CV charge curve with 100mA termination, but there is one serious problem: The charger do not charge to 4.20 volt, but to 4.30 volt. At 500mA charge current the problem is exactly the same. The two other cells works the same way with CC/CV and over charge. 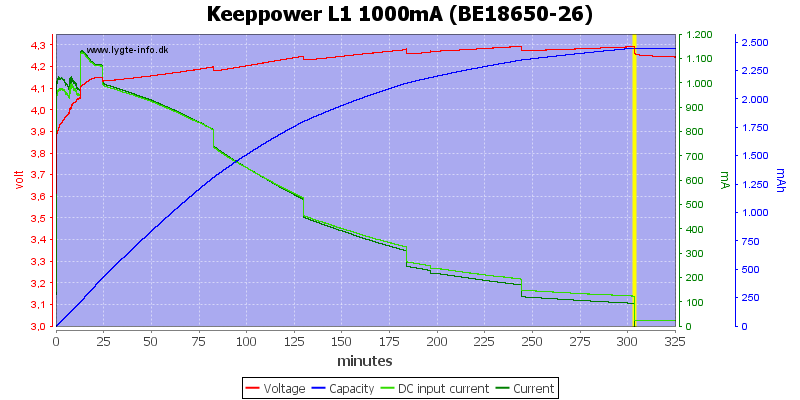 The charger has no problems with the older cell. 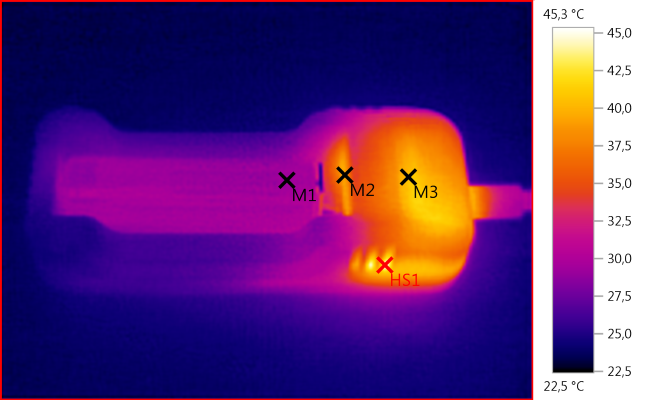 It looks like there is some small problems with the charging at 500mA for this cell. Due to this the end result is slightly better. The battery stays cool in this charger. The charger needs about 5 second to start. 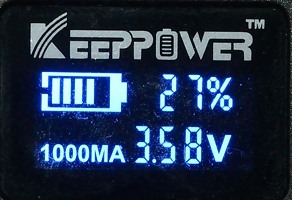 The charger current can be switched at any time during charge (if the display is on). 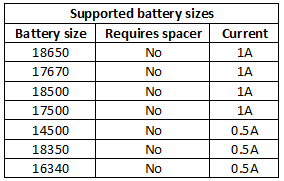 The charger looks nice for a single cell charger and with two current settings it can handle most cell sizes, but the higher voltage makes it nearly useless (There is a few 4.3 volt batteries on the market). 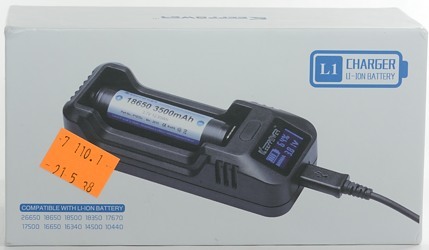 Generally I will not recommend this charger, but if you have some 4.3 volt cells it can be very useful (Just remember to mark the charger clearly). 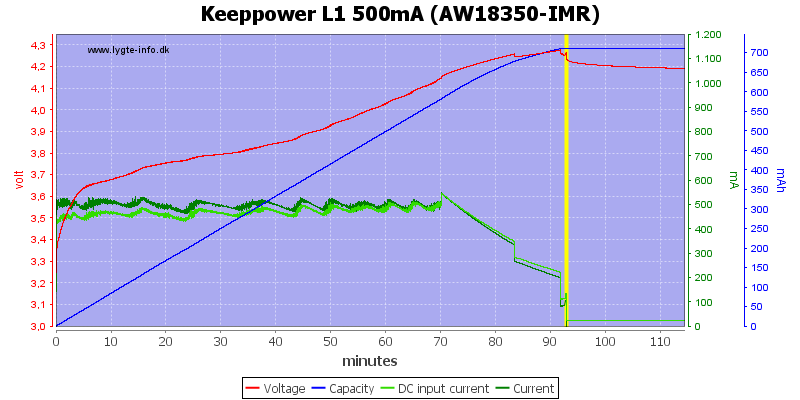 If Keeppower fixes the over charge and makes some way to recognize fixed chargers, it will be a good charger. Using this charger will not make quality batteries explode, but it will reduce the lifetime of the batteries significantly.